Short-term exposure to strong underwater noise is known to seriously impact fish. However, the chronic physiological effects of continuous exposure to weak noise, i.e. the operation noise from offshore wind farms (OWF), remain unclear. Since more and more OWF will be built in the near future, their operation noise is an emerging ecological issue. To investigate the long-term physiological effects of such underwater noise on fish, black porgies (Acanthopagrus schlegelii) were exposed to two types of simulated wind farm noise—quiet (QC: 109 dB re 1 μPa / 125.4 Hz; approx. 100 m away from the wind turbine) and noisy (NC: 138 dB re 1 μPa / 125.4 Hz; near the turbine)—for up to 2 weeks. Measurement of auditory-evoked potentials showed that black porgies can hear sound stimuli under both NC and QC scenarios. Although no significant difference was found in plasma cortisol levels, the fish under NC conditions exhibited higher plasma reactive oxygen species (ROS) levels than the control group at week 2. Moreover, alterations were found in mRNA levels of hepatic antioxidant-related genes (sod1, cat and gpx), with cat downregulated and gpxupregulated after one week of QC exposure. Our results suggest that the black porgy may adapt to QC levels of noise by modulating the antioxidant system to keep ROS levels low. However, such antioxidant response was not observed under NC conditions; instead, ROS accumulated to measurably higher levels. This study suggests that continuous OWF operation noise represents a potential stressor to fish. Furthermore, this is the first study to demonstrate that chronic exposure to noise could induce ROS accumulation in fish plasma. Marine mammals can adjust their vocal behaviors when they encounter anthropogenic noise. The acoustic divergence among different populations has also been considered as the effect of ambient noise. The recent studies discover that the marine soundscape is highly dynamic; however, it remains unclear how marine mammals alter their vocal behaviors under various acoustic environments. In this study, autonomous sound recorders were deployed in western Taiwan waters between 2012 and 2015. Soundscape scenes were unsupervised classified according to acoustic features measured in each 5 min interval. Non-negative matrix factorization was used to separate different scenes and to inverse the temporal occurrence of each soundscape scene. Echolocation clicks and whistles of Indo-Pacific humpback dolphins, which represent the only marine mammal species occurred in the study area, were automatically detected and analyzed. The preliminary result indicates the soundscape scenes dominated by biological sounds are correlated with the acoustic detection rate of humpback dolphins. Besides, the dolphin whistles are much complex when the prey associated scene is prominent in the local soundscape. In the future, the soundscape information may be used to predict the occurrence and habitat use of marine mammals. 1. Richard Fay (2009) Soundscapes and the sense of hearing of fishes. Integrative Zoology 4: 26-32. 2. Stephen D. Simpson, Mark Meekan, John Montgomery, Rob McCauley, Andrew Jeffs (2005) Homeward sound. Science 308: 221. Here is the new online article regarding the seasonal distribution change of coastal dolphins. River estuaries are dynamic regions that are influenced by the interactions between freshwater and seawater as well as seasonal variations in river runoffs. Studies focusing on the distribution of Indo-Pacific humpback dolphins (Sousa chinensis) have indicated their general tendency toward estuarine habitats. The seasonal activities of humpback dolphins are likely to synchronize with environmental fluctuations. This study investigated the effects of seasonal changes in river runoffs on the distribution gradient of humpback dolphins by deploying acoustic data loggers along the Xin Huwei River estuary, Western Taiwan, between July 2009 and September 2012. Seasonal shifts were observed in the areas with high detected duration of humpback dolphins, which mainly stayed near the river mouth during the dry seasons but moved seaward during rainy seasons and following heavy rainfall. In addition, the gradient of ambient ultrasonic pulses, dominated by snapping shrimp sounds, exhibited regional differences following heavy rainfall. The outward movements of the humpback dolphins and the snapping shrimp sounds in the estuary indicated a temporary trophic-system shift in response to local environmental changes resulting from high volumes of river runoffs. In the future, the seasonal variation in the distribution of humpback dolphins must be considered during the conservation management of this critically endangered population. Please contact me if you are interested in this article. Also feel free to discuss here! This paper offers the first study of diurnal variations in the use of an estuarine habitat by Indo-Pacific humpback dolphins. 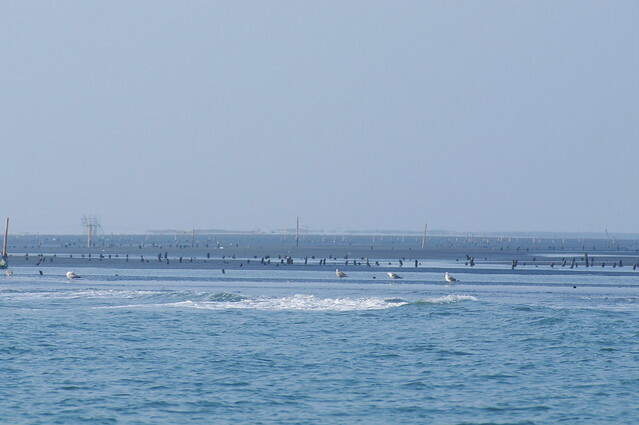 Passive acoustic data loggers were deployed in the Xin Huwei River Estuary, Western Taiwan, from July 2009 to December 2010, to collect biosonar clicks. Acoustic encounter rates of humpback dolphins on the riverside of the estuary changed significantly over the four tidal phases, instead of the two diurnal phases based on the recordings from 268 days. Among the tidal phases, the encounter rates were lowest during ebb tides. Additionally, circling movements associated with the hunt for epipelagic fish significantly changed in temporal and spatial presence over the four tidal phases, matching the overall pattern of encounter rate changes in the focal estuary. Our findings suggest that the occurrence pattern and habitat utilization of humpback dolphins are likely to be influenced by the tidal-driven activity of their epipelagic prey. Welcome to contact me if you need a copy of this article! A coastal view of western Taiwan. The tidal difference can reach to 4 m in central western Taiwan, thus alter coastal environments and animals periodically.